Does that mean I resigned myself to a series of brief two mile hikes all Spring? NO MA’AM. I am nothing if not tenacious. 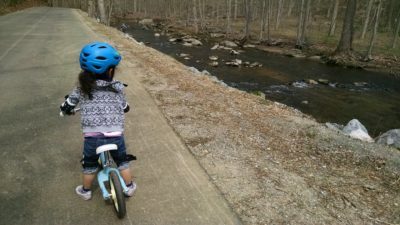 For our adventure yesterday, we visited the paved Ridley Creek State Park Trail with EV6’s push-bike and our awesome new set of Strider Bike Pads (I highly recommended then for tiny kids!). I figured if I could get two walking miles out of her, she might actually make it the entire 4.8 mile loop on a bike! First things first: getting there. TrailLink gives the address of the parking as “480-598 Barren Rd, Media, PA 19063,” but if you put that into your favorite map program you’re going to find your destination is the middle of a long, winding, country road. 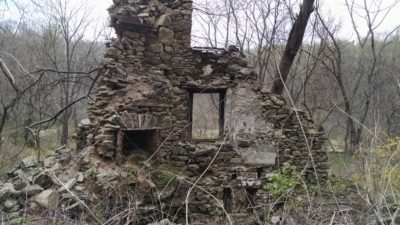 You just need “598 Barren Road,” or even “100 Chapel Hill Road,” which is the T intersection of Chapel Hill Road with Barren Road to the left of the T and Sycamore Mills Road to the right. Little Miss looks out over the rapids after tackling an uphill ride. That said, there are only about a dozen parking spots there – it was totally full on a cool, cloudy day on Spring break, so I imagine in the summer it’s utterly packed. There are a few more alcoves for parking along Barren Road, but you might have more luck back on Chapel Hill. After missing the destination and pulling a rather epic U-turn to return we were faced with chilly weather and a smattering of raindrops. I won’t lie – I considered getting back in the car. However, EV6 was already astride her bike and had spotted a waterfall in the distance, and would not be deterred! We chose the right hand path through the loop, which started with less changes in elevation, and set off on our way. The bike and the slightly more interesting scenery made a massive difference in Little Miss’s engagement compared to the Darby Creek hike. When she wasn’t busy zooming on her bike and following the rules by yelling, “I’m passing!” at pedestrians, she was stopping to admire the river – complete with fallen trees and swimming ducks. We made multiple excursions down to the edge where it was practical, and she was fascinated with various fishers with their trouting permits. She was also very interested into the many side paths and off-road hikes, but I wanted to keep her focused on biking for this first trip. As for me, I discovered that hiking alongside EV6 on a bike is an entirely different experience.It won’t be long until she’s sure enough on a pedal bike that I can ride alongside her, but for now I’m stuck on foot. I was doing my typical fast walking, and at points even had to jog to keep up! There were some mild uphill spots, but nothing she couldn’t handle with a bit of gentle pushing from me – plus, they made for super-fun downhills on the return trip. Yes, return trip. As it turns out, a 4.8 mile ride was a bit too ambitious for the little one. She made it about three miles. I was impressed on how she decided it was time to turn around. At each marker, we discussed how far we had travelled and how far it would be to return, rather than go one. When we hit the one mile marker (which is more like 1.3mi from parking) I told her it would be 1 parts more to go back or 2 parts more to go forward. She decided discretion was the better part of valor, and we reversed course. We both really loved Ridley Creek State Park Trail! The only reason we didn’t go back again this morning was because the allure of the playground at Darby Creek won out. I’m really looking forward to getting her through the entire 4.8 miles of it over the course of the next few months, as well as sampling some of the side trails.